Tata Sky offers a consumer migration agreement for Reliance DTH, Dish TV also in play. 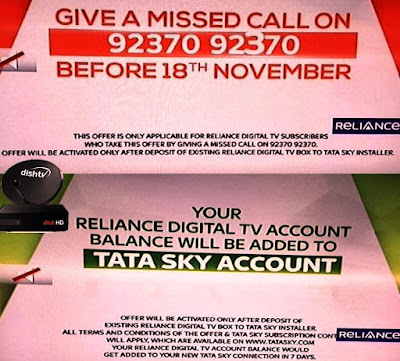 It is reported that Tata Sky is offering consumers of Reliance Digital TV a limited time offer until mid-November 2017 to migrate to their platform at no additional cost. Reason: As of DTH News: Reliance Big TV may Shut Down Next Month According to Sources. Reliance is not renewing its DTH license that expires in November 2017. Although none of the companies involved receives official confirmations, a message displayed on consumer TV sets from Reliance Digital TV informs callers to a designated number or give a missed call on which the consumer receives a call from your new DTH service provider. The message mentions a number 9237092370 to be called. When the reporter called the number, a recorded message read: "Thank you for showing interest in Tata Sky." We will get in touch with you within 72 hours." According to a possible agreement signed between the two companies, Tata Sky will offer consumers of Reliance a mechanism that involves the installation of free STBs and satellite dishes for a painless migration in a valid offer until November 18, 2017. Tata Sky is also promising the approximately one million Reliance Digital TV consumers, mostly prepaid that their Reliance credit money will be transferred to the new Tata Sky accounts. However, industry sources indicated that the first private sector DTH operator Dish TV also informed its distributors that any consumer of Reliance Digital TV that has not migrated to a competitor's platform should be subject to acquisition after paying to that consumer a single rate of about Rs 1,000. Dish TV is in the process of amalgamating the operations of Videocon d2h DTH with itself while waiting for some regulatory authorizations. 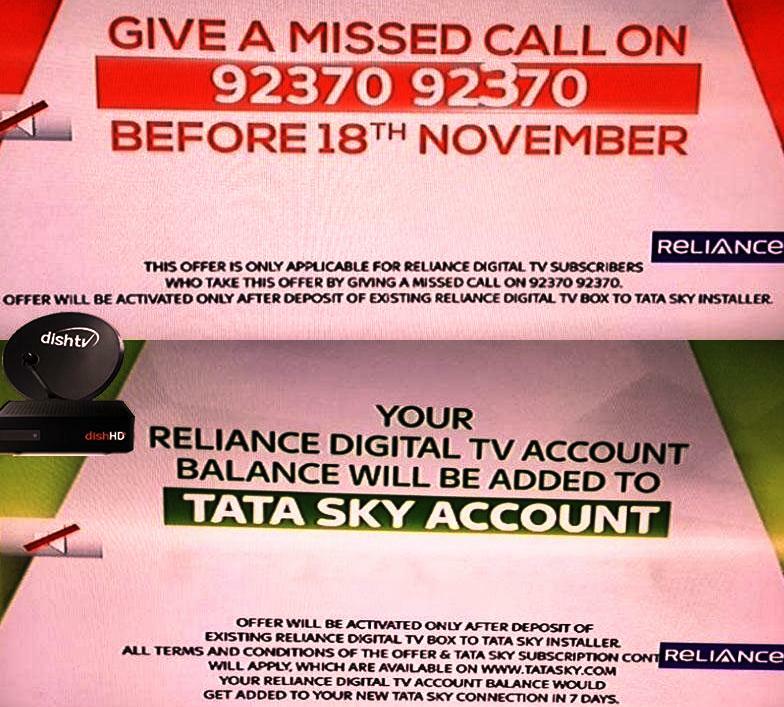 A few days ago, Reliance Communications, parent of Reliance Digital TV, had informed the Bombay Stock Exchange: "The DTH operation is a non-core activity of the company provided through Reliance BigTV Limited (RBTV), a subsidiary of The Company The RBTV DTH license expires at the end of November 2017 and the company is currently working with three leading DTH operators for a smooth migration of customers to enjoy uninterrupted services." It is not yet clear whether regulatory authorizations should be taken by other satellite TV operators in India for customer acquisition of Reliance's DTH operations, which will soon be closed. When SatTV contacted regulator TRAI and the Ministry of Information and Broadcasting last week, officials from both organizations said they were unaware of Reliance Digital TV's future plans and also why they did not renew their DTH license as no official communication had been received by them until then.